Since much has already been written about the relation between antidepressants during pregnancy and increased risks in the offspring, the aim of this thesis is to evaluate translation of previous findings into current practice. We examine international differences in management of antidepressants during the perinatal period and observe the Dutch situation at greater detail. Additionally, we examine a clinical sample to identify risk factors for recurrence of depression in the perinatal period in women taking antidepressants. Last, we examine the influence of (untreated) symptoms of psychopathology and stress on child outcomes from a biological perspective. 1. 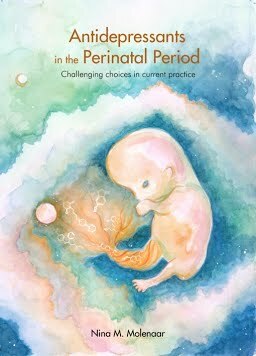 What do internationally available guidelines recommend when it comes to treatment of perinatal depression and/or the perinatal use of antidepressants (chapter 3)? 2. Are Dutch gynecologists and midwifes aware of the Dutch guideline on antidepressant use during pregnancy and do they adhere to this guideline (chapter 4)? 3. In what way have Dutch perinatal dispensing patterns of antidepressants developed over time and to what extent was the introduction of the guideline of influence (chapter 5)? 4. With what design can we examine the efficacy and safety of discontinuation of antidepressants during pregnancy (chapter 6)? 5. Which women with antidepressant use during pregnancy have recurrence of depression in the perinatal period (chapter 7)? 6. Is maternal psychopathology and stress during pregnancy associated with longterm HPA axis activity in the offspring (chapter 8)?